The Terminator was released by Virgin Games on the Sega Mega Drive and Genesis in 1992. Licensed games have always been a bit of a gamble; they're often average at best, but there are some exceptions like Aladdin which is one of my favourites on the system. I still have the game cartridge that my cousin owned back in the early 90's, but is it any good? Let's take a look in this review... The game opens with a title sequence similar to the style of the iconic movie. Playing on a PAL Mega Drive, the music is great, but it can sound slightly too fast on a Sega Genesis. This is due to the European version running at 50Hz instead of 60. Thankfully, if you're choosing to play this on an emulator, there is an option to set it to PAL mode. You play the entire game from the perspective of Kyle Reese, starting out in the future armed with an unlimited supply of grenades to lob at your foes. While this feels very awkward to start with, and laborious as you make your way through the initial corridor full of Terminators, it's not long before you're able to find a gun and start making some real progress! While you can soak up a lot of damage, I still used to die a lot on the first level when I was younger by trying to clear everything out. The trick is just to ignore your health bar and keep pushing through. Occasionally enemies drop health pick-ups when your on your last legs, so don't worry, just endure the pain. As an introduction, the first level sets a good standard with plenty of action, great music and visuals which fit the style of the movie. Setting off the explosion and having to escape the base within the time limit, provides a real sense of tension, even if you're experienced with the maze-like layout. From there, you're taken back to the present, which... is now the past seeing as it was set in the 1980's. This is where the game gets a bit more linear and easier as you make your way to the Tech Noir nightclub. Thankfully, the action is still enjoyable, blasting enemies away, but it doesn't quite capture the same level of excitement of the first stage. Here you get to fight a Terminator boss at the end, but he goes down relatively quickly in three short bursts of fire. The third level has you escape the police station which comes with a few frustrations. Sure, you're fighting more of the same enemies, but it's their random placement that can get annoying. For example; on the stairs it can be very hard to take them out as you can't jump and shoot, so you're almost guaranteed to die. There's also a drop through the roof later on where you've got to be quick or that's another inevitable death. 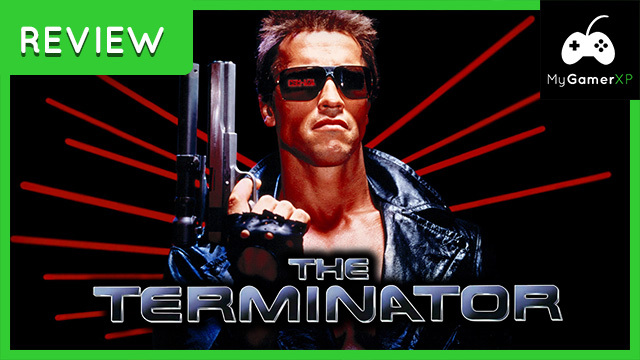 At the end, you fight the Terminator again, but the same method applies from the previous level. It's okay, but nothing special. The fourth stage is the final level. Yes, you heard me right; just 4 levels. This is arguably the biggest problem with the Terminator; it's far too short! Licensed games often have strict budgets and short timeframes for completion, but seeing as this came out 8 years after the original movie's theatrical release, I struggle to understand what the rush was all about, if that was the case. My guess is that it was to somehow coincide with the VHS release of Terminator 2: Judgement Day, as I assume they couldn't get the license for latest movie, but that's just my thoughts on it. There are no enemies here, it's just you versus the Terminator in a tricky level with plenty of dead-ends and ladders that are sometimes obscured by the background. This is possibly the most frustrating part of the entire game. For some reason you can't shoot the Terminator when he starts crawling on the ground, he randomly appears in places that don't make sense, and you can't really jump over him. The worst part about this is that while you can take a lot of shots to the face, you only have one life and no continues. So if you get trapped in a corner and he walks into you, that's it... you're dead... and you have to start from the very beginning again! One method I found to help avoid some of the frustration was to try and keep the Terminator on screen when he is behind you, as once he goes off-screen he can spawn randomly in front of you which makes things tough as you can't jump over him very easily, or at all. So, this keeps him behind you and avoids any nasty surprises. That is, apart from dead ends. So this will take you a few attempts. So overall the action is fun, the graphics are good, the music is great, but the game is really short. On your first experience it might take you a few hours to complete it, but once you know where to go and what you're doing it can take around 15-20 minutes. If the developers had more time, it would be great to know how this game would have turned out. After such a promising start, you can tell they were passionate about this project. I understand it may have been difficult to create an in-depth game of a movie with such a simple story, but possibly alternating between between Kyle and the Terminator as playable characters, or just more enemies, larger levels, and more objectives would have existed. It certainly feels like more time was spent on the first level than the others. For those interested, it is worth noting that the Terminator game on the Mega CD and Sega CD is different to this version, with more levels, shooting action and a really impressive soundtrack. I certainly hope to cover that in the future! As for the Terminator on the Sega Mega Drive and Genesis, would I recommend it? I'd say yes if you're a fan of the movie or if you like to play action games in short bursts. The quality of what exists is good and fun to play, there's just not much of it. Pick it up if you find it cheap. As long as you know what to expect, you shouldn't be too disappointed. You are subscribed to email updates from MyGamerXP.